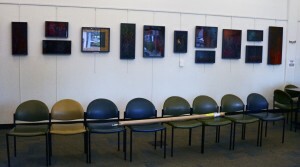 When I submited my art for exhibition at a small local library, I didn’t consider it such a significant opportunity. Rather, just a way to keep my work visible and out of my studio. The library’s space for exhibiting consists of one large wall in a side room where children come for story time on a weekly basis and various other small community events take place. I kept telling myself and others that it was really no big deal of a venue. However, I quickly ate those words when pulling the community newspaper out of my mailbox and finding my photo on the front page! What a shock! Even my contacts at the library stated that this exposure is rare for any of the artists they feature. I can only assume the community didn’t have as many front page news events to feature, somehow making me a blessed recipient of story promotion. As a practicing artist, I have come to believe that there is no opportunity too small or insignificant to seize. Since the newspaper feature, I have had many people in our neighborhood, some barely acquaintances, express their congratulations and best wishes for the show. The warm and unexpected response has taught me that you just never know where one small opportunity can lead. 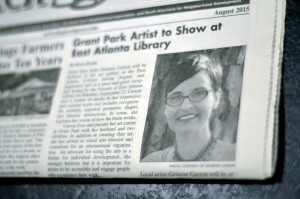 A small neighborhood library exhibit led to front page coverage, which led to unexpected community recognition, website hits and additional exhibition leads. Like dominoes, one opportunity is uniquely leading to another. By being open and grateful for any audience I am granted, I’m experiencing growth in artistic experience and creative momentum. And, I’m finding that the encounters I’m having in everyday locations seem to provide more authentic connections with the individuals viewing my work. As a benefit, my work is becoming commonly seen and known in places where life just naturally happens, generating growth in reputation by its steady presence in the community. This adds to my feeling of being a working part of society, an artist as citizen. Sure, there is a marketing strategy to how often artwork is seen and in what reputable locations. Artists need to make a living just like anyone else. But, I find seeking fame and payback detrimental to the creative process. This is when we take ourselves too seriously as artists and may even be tempted to compromise. I’m discovering that through these small homegrown encounters, I am gaining a more authentic patron base, one valuable person at a time. These are people who have come into contact with my work at their local café, church, favorite restaurant, etc. Through these intersections, they are becoming accustomed to my art gracing the walls of their daily routines, and relationships are forming. As a result, the need to hit the pavement with portfolio under arm has been less demanding than expected. It takes one person to be interested in my artwork to the point that they will generously assist in opening up another door for people to engage with it. How very humbling and much more pleasant. Beth, yes! Let’s be artists who love and engage our own community well. It may look like a small goal, but really it is all but. I find it actually requires more investment on my part, but the return is a gradual solid increase…a bit like the interest made when having a bank account.